Spleen and lymphatic system are part of what is called Earth energy; the sweet vegetables well cooked have a particularly beneficial effect on this energy, as well as the azuki beans. However the azuki, like all legumes, strengthen also the kidneys, namely energy ball called water energy; Therefore we can say that the azuki while reinforcing energy land and water. Finally, the kombu seaweed is more Water energy and thus strengthens the kidneys. Wash and soak for a few hours or overnight the azuki beans. Place the kombu in the bottom of a heavy saucepan and add the pumpkin. Add the azuki over the pumpkin. Add water until it covers the pumpkin. At the beginning do not cover the pot. Bring to a boil, covering only after 10-15 minutes. Cook over low heat until the azuki are not about 3 4 \ cooked (about an hour or more). The water evaporates and the azuki dilate, so every now and then add water on the side of the pan to keep the constant level and to make the soft azuki. When they are cooked for about 3 \ 4, add salt, cover and cook for 15-30 minutes or until most of the water has evaporated. Turn off and let it sit a few minutes. Do not mix the ingredients while cooking. If the pumpkin is not available, use carrots, onions or parsnips. 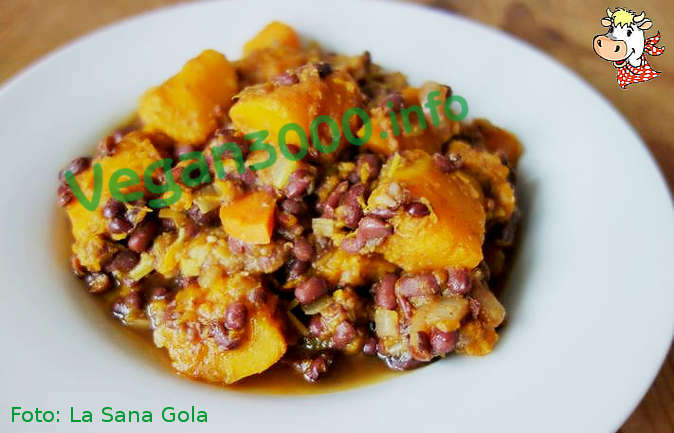 You can also use lentils and chickpeas instead of azuki beans. The azuki Hokkaido cost a little more, but you cook much faster and they are delicious. You can get a spreadable cream by blending the end or even with what advances after serving dish. I gave this to my daughters as a snack with a little bread-if the pumpkin is pretty cake is like a dessert!